As with any communication or activity in Sentle, calls are neatly stored in a contact’s activity timeline making it easy to locate historical call data for any reason. 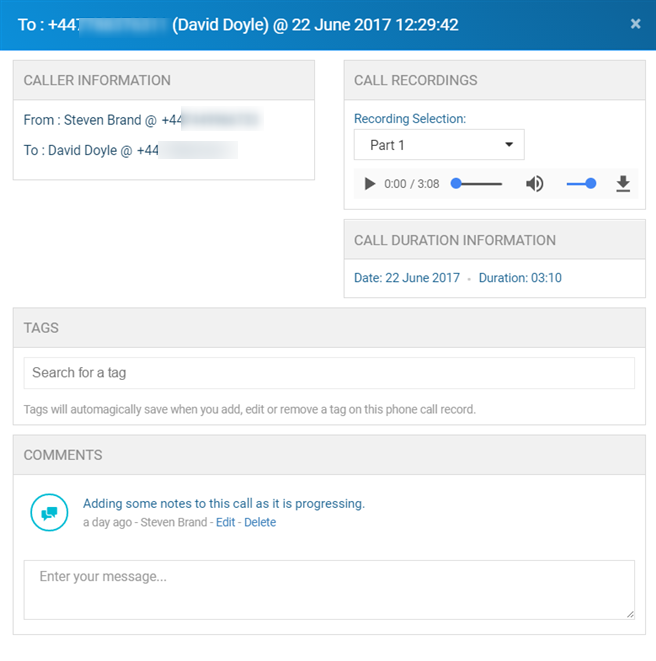 Calls will be listed in the timeline as below with inbound calls listed on the left of the screen and outbound call listed on the right. Within this window, you will be able to play back the call recording and choose specific parts of the call to listen to if the call was transferred at any point. The call recording can be downloaded if required by using the download arrow icon located to the right of the volume slider. You are also to add notes to a call by typing in the comments box and selecting the blue ‘Submit Comment’ button.